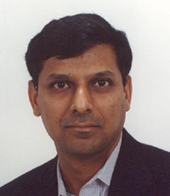 That he will be the first Indian to hold the position of Chief Economist at the International Monetary Fund is only besides-the-point for Raghuram Rajan. "People tend to read too much into it," says the 40-year-old Professor of Finance at the Graduate School of Business, University of Chicago. It has been a fairly eventful year for Rajan who won the coveted Fischer Black Prize awarded by the American Finance Association that recognizes outstanding contributions to finance by a person under 40. Soon after, he released his third book, co-authored with Luigi Zingales, Saving Capitalism from Capitalists: Unleashing the power of financial markets to create wealth and spread opportunity. In an extensive interview with rediff.com's Shakti Bhatt, Rajan -- a graduate of the Indian Institute of Management, Ahmedabad -- discusses the IMF's changing role, the backlash in the US against outsourcing, and why he finds it 'funny' that India is now an IMF lender. As IMF's Chief Economist you will have a great deal of influence on the organization's policies. How do you feel about that? It's a tremendous opportunity and responsibility. There is a lot of ability to influence the outcome. There are enormous challenges and learning values in this job, which I am looking forward to. At the same time, I must say the IMF is a very successful institution full of smart people. When you go into such an institution you have to be aware there are typical processes and thinking which are hard to change partly because they have been successful in the past. So I am not going in there with the idea that I am going to be a missionary. On the other hand, there are issues that they haven't devoted enough resources to in the past. For example, one of the things they have been looking at in more recent times is how to create financial infrastructure in many countries that don't have very good infrastructure. How to strengthen the system so that you don't have countries repeatedly going into booms and then bust. Also, to some extent their earlier focus was on macroeconomics. How do you get the budget deficits in order? How do you reduce spending? Increasingly, their focus has turned to infrastructure. How do you make sure that the banks are sound? How do you make sure that people have enough information to make appropriate investments? How do you ensure that people who make investments have the investment protected and not confiscated either by the government or by people in the private sector? So, these infrastructural issues have become more and more important because people realize that countries are staying poor not so much because they are incapable of becoming rich but because they don't have the necessary infrastructure to develop. Thinking about creative ways to help countries do that would be an important new approach. Do you have any preliminary thoughts on how to go about that? No, I don't want to prejudge the issue. There is no silver bullet here. It is not that the IMF is going to come in and say 'Ah, this is the one thing that countries should do which will make them work.' It's a whole package of issues. The important thing to do is paying attention to these, which the World Bank and the IMF have started to do. The recent protests the world over against the IMF, World Bank and the WTO have often accused these organisations, amongst many things, of a lack of transparency, and therefore being undemocratic. Do you think that is true? See, here is the issue. The protestors against globalization are sometimes misguided because they are not quite clear on what they are protesting against. Some people, for example, are protesting against the fact that workers in India or China work for 10 to 13 hours a day. They are saying 'What terrible working conditions!' But you know what? Workers in India and China can compete with workers in the West who have far more capital and far more education only by working longer hours at lower pay. If these workers were to ask for the same working conditions as workers here they would be out of a job very quickly. So until they can produce more or become more productive through a better education and better health care system, which will happen over time, they will have to compete by accepting lower wages. So the issue of 'Oh, this globalization is forcing those workers to work in terrible conditions.' No, this is not globalization. If you force them to have the same pay, it's a form of protectionism. You are essentially shutting them out of the world market. These workers in India and China, who are able to compete in the world market, are able to thereby achieve a much better standard of living. This argument is not just made of workers. It is made of software workers, right? 'Oh, these Indian software workers coming and working 60, 70 hours at half the wage that we earn. It is unfair, they should be kept out', etc. This is plain and pure protectionism. Similarly, there are arguments made about multinationals destroying countries and so on. There's always a grain of truth in these arguments. But if you play them all out -- what they are suggesting is often complete nonsense. There has also been criticism of the structural adjustment policy that the IMF has traditionally pursued. Where do you stand on that? I don't want to get into that argument because I don't know what exactly was behind it. I do know that the IMF in some documents has admitted that it was probably overly aggressive in asking for expenditure cuts. Soon when they saw this was having a very adverse effect they retreated and had more reasonable targets. I am not saying -- and I don't want to say -- that these organizations are beyond criticism. There are valid criticisms of their actions in the past. What is important going around is: Are the organizations prepared to adapt and change? Are they trying to do things in the best interests of the people of the member countries or they basically trying to infuse a quasi-imperial diktat from the past? The evidence and my impression is certainly of the former than the latter. Do you think as an Indian you will have a unique perspective to offer? I will certainly have a perspective from being raised in India. But here are people who have spent 15, 20 years of their lives traveling to other countries and clearly they have some perception of life and what it is like in those countries. So I don't claim to have more insight just because I was born and brought up in India. But I am conscious of the fact that I am an Indian and therefore I would certainly have some sensibilities in that direction. India just became a lender in the IMF. (Laughs for a long time). Well, you will understand when I say that it seems a great source of national pride and to some extent it should be that we actually are in a position that we can lend and part of it has to do with we are redeploying our enormous reserves. But that said, a country like ours needs tremendous resources and really in the larger scheme of things, a developing country should be a big debtor rather than a creditor. In a small way, this is fine that we are putting our resources back into the IMF. But in the larger scheme of things if we were really doing the right thing, we should be borrowing a lot and investing a lot. Think about it, any growing economy should be investing tremendous amounts. I would say being a small creditor is fine but let us not get too carried away. Do you find it ironic that India is now a lender? it will reflect some failure also. In your book, on the one hand you are advocating the breaking down of all trade barriers in developing countries like India and China and on the other, you mention renewed protectionism and other ills that the apparently free market of the US suffers from. How do you reconcile this? We are saying that in order to further growth, markets are really very good. But the problem is the poor will look at the markets and say 'Oh, they are terrible, they just work for the rich.' In some ways they are right because in many countries the markets are skewed such that they work only for the rich. To give an example from India, many industrial houses didn't care that the Indian stock markets were particularly underdeveloped. Because they had access to these development financial institutions, they had access to the banks and essentially what it took was a phone call from Delhi to open the doors to financing. With competition, as India has opened up in the 1990s, they see that they are facing competition from foreign institutions which have a fraction of the costs of capital that Indian firms have. When they see this they start saying 'Oh, we have to start improving infrastructure, we have to start getting our own access to finance.' Then comes the pressure on the government to say 'Ok, you can't fix interest rates this way. You can't have such awful rules of corporate governance on the market. You have to have a regulator with teeth.' Then comes the political push on a wide front to reform the system and improve its working and that will bring the fruits of capitalism to all. So are you offering India the US model? No. I am not saying it has to be the US model. All I am saying is that each country can choose its own model. But there has to be a political will to do that. And often the political will to do that come when there are outside comparative forces, which say business as usual is not possible, and you have to change. But isn't the US model the most dominant? everyone, not just for a few. And if you have that kind of a model, growth is going to be tremendous. Do you think the US model works for everyone? No (laughs). But again, the US model enhances competition in many ways. That is what is critical to a well-functioning capitalist economy, to have competition and access. What that means is good education and health care for everyone so they actually get a seat at the table in order to compete. In case they actually find it impossible to compete, you have ways to try and bring them back to the table to compete. For example, workers in industries that are decimated by foreign competition, the steel industry in US for example, you need to provide these workers the ability to retrain so that they can find jobs in other areas. They might never regain the kind of lucrative jobs they have in steel. That is one of the costs of competition. But on the other hand, you want to find ways that you can compensate them for the fact that their jobs are lost. Not so much because it's the moral or ethical thing to do. If you don't have a safety net for the people who lose out you can get a backlash against the system. What you speak of safety nets do you mean protectionist measures? No, protectionist measures protect industries. I think that's terrible. What we suggest is protecting the individual. The best form of safety net is improving your human capital, your skills, retraining, providing health insurance and so on. There might be some industries where people really don't have hope and there is no way you can retrain them for anything except jobs at McDonalds. If so, there might be a case for a monetary safety net. So you are against protectionism of any kind? I am against protectionism of any kind. What do you think of the current backlash against hi-tech and now even low-tech jobs moving from the US to countries like India? We have to find ways to face up to it. Because in the long run it is going to make everyone better off. That does not mean there won't be localized pain. This is why it is better for countries to alleviate that localized pain rather than erect barriers. Because the barriers will eventually have to come down and then the pain will be even greater. For example, if guys in India can type up hospital records at a much cheaper cost than people here, truly some jobs will migrate to India. You could erect barriers and say no public or state-funded hospitals will be allowed to send records there. But that will immediately imply that state-funded hospitals will be more expensive than their private counterparts here. Which then will mean they will have to draw more from the public purse. In these times of tightening that will imply more public hospitals will have to close. In general, the people here will be made worse off. Transport that to the computer industry. If the cost of manufacturing software goes up in the United States, computer firms here are going to lose out relatively to computer firms in Germany, Japan or in India. Eventually, the loss will be much greater because you can't compete. It is better to find ways to deal with these job losses by providing safety nets. Your book reads like it was not written for a student of economics but for the general reader. How would you compare the US and India as far as economic openness is concerned? This is a difficult one to answer. India is less open than the US but I think we are headed in the right direction.